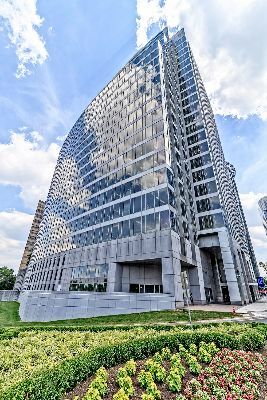 Located in the heart of popular Rosslyn is the Waterview Condominium—a high-rise with some of the most breathtaking views in all of Washington Metro. Completed in 2008, this supremely modern complex is comprised of a series of 300-foot components that resemble soaring curved shelves. The buildings range from a 24-story office tower to a residential obelisk that tops out at 31 floors! Perched at the edge of the Potomac River, this 2.16 acre site is steps from the Francis Scott Key Bridge. Floors 1-15 are dedicated to a hotel with 155 suites, while floors 16-31 are condos for sale. And what is the cost for such sublime luxury? Prices start around $425,000 for studio units and top out at $6 million for a penthouse city home measuring more than 4,500 square feet. The two sections of the Waterview are conjoined by a fourth-level terrace that is home to a high-class destination restaurant with sweeping water views. There is luxury and there is decadent opulence. Guess which best applies to this vision of glossy excellence? This is about as fancy as it gets when it comes to urban waterfront properties for sale. The design, from Pei Cobb Freed & Partners, has garnered a bunch of awards, just to cement the obvious. What awaits inside if you decide to plunk down your hard-earned cash? Blonde floors, industrial-chic gourmet kitchens, solar shades, expansive glass window walls offering unequalled views of the river and the DC skyline. Plus, giant bathrooms with stone floors, deep soaking bathtubs, towel warmers and more. There’s also an outrageous 31st floor observation deck with lounges, fireplaces and dining areas where residents can just hang out and dig the view. You can add a state of the art fitness centers, health spa, concierge service, dry cleaning service and extra recreational offerings to keep residents happy—like private wine tastings and tours of the nation’s capital. There may be times when you decide the leave the sanctity of the building, however. Like taking the dog for a walk to Freedom Park, or grabbing a bite to eat at Piola, Café Asia, Kanpai or Red, Hot and Blue. And when you really feel like being sinful, get some takeout from Ray’s Hell Burgers and munch on fries up on the observation deck. Condos for sale at the Waterview in Arlington VA are about seriously elite living in Arlington. And when it’s time to leave your awesome pad and head to work, you can collect your car from the valet service and wheel over the bridge to Capitol Hill or wherever it is you work, or simply walk a block to the Rosslyn Metro. Located at 1111 19th Street, the Waterview Condominium is a place you need to check out if you’re seeking true luxury living with a view.